From Guest Author Kyle Elliot. Using microorganisms to solve human needs is hardly anything new; from crude-oil producing algae to pro-biotic drinks, a whole host of miniature marvels are proving that bigger is not necessarily better. And in the world of waste management, we're no strangers to the principal; technologies like anaerobic digestion have been installed for decades now, turning waste into useful biogas that can be fed back into generators for heating and electricity. 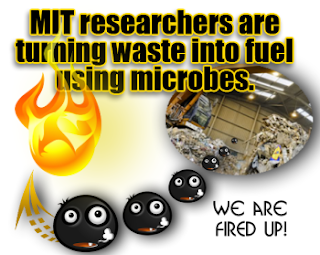 This week, however, a whole new level was useful waste-usage has been reached by the scientists at MIT, whose latest advancement is a bacteria with a rather special party trick - turning waste into fuel. To give the bacteria it's proper name, Ralstonia eutropha is naturally a miniature plastics factory. Whenever the organism is stressed, it goes into 'carbon storage mode'; taking carbon from any source -and given the sheer amount of carbon in the world, it never falls short - and turns it into a polymer that it can break down for later use. Whilst plastic seems so inorganic and man-made, Ralstonia eutropha's polymer shares many properties with petroleum-based plastics, according to Christopher Brigham, a research scientist in MIT’s biology department. Brigham explained that his research team saw the bacteria's potential as a two-birds-with-one stone potential - a natural resource which could provide a waste management solution and produce fuel, by knocking out a few genes, inserting a gene from another organism and tinkering with the expression of other genes, Brigham and his colleagues were able to redirect the microbe to make fuel instead of plastic. The result is this specially-engineered organism, which breaks down carbon and produces isobutanol - which can be directly substituted for, or blended with, petrol and other fossil fuels. Whilst the team's marquee experiment has been getting the microbe to use pollutant CO2 as a carbon source, elsewhere in the laboratory, the microbes have been using fructose, a sugar, as their carbon source. Even focusing on fructose, the MIT-produced bacteria could be introduced into landfills, breaking down food waste, agricultural waste or municipal waste into something that could directly fuel automobiles or generators - with no harmful byproducts. Whilst it will take years more research to perfect the bacteria and plan how it would work within existing facilities, this environmental-issue-busting 'two-for-one' has already proven itself as a potential waste management solution to watch for in the future. Article sponsored by waste management solution provider MT Waste. With anaerobic digestion becoming progressively more popular in recent years, the question arising more and more often in people's minds is the how to assess the balance of advantages and disadvantages of the two processes when wondering whether to adopt anaerobic digestion vs aerobic digestion at the outset of a project. For the purpose of this article, in order to avoid complicating the issues unnecessarily, we shall limit our discussion to the case of organic waste processing and not energy crop production. 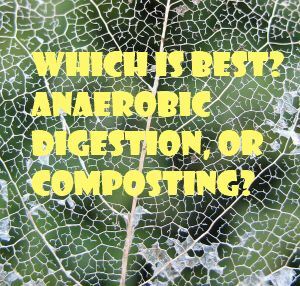 Reasons In Favor of anaerobic digestion vs aerobic digestion are very significant if you decide to choose just one or the other for your project. However, while reading this please bear in mind that there is no reason why an aerobic digestion system (which is more correctly known as composting) cannot be incorporated on the same site beside the anaerobic digestion (AD) plant. By doing this the owner of a waste can have the best of both worlds very often. 1. Returning to the benefits of anaerobic digestion, probably the most important benefit not available to the "composter" (aerobic digestion plant operator) is the ability to produce a valuable gas, known as biogas. By burning the biogas produced in an anaerobic digestion plant, energy can be used on-site, or the sale of excess energy can be used to generate revenue from the AD plant. Such projects gain good publicity because they provide sustainable renewable power from plants which are often called Waste to Energy (WTE) Biogas Plants, or may be described as Energy from Waste (EfW) facilities. 2. A second advantage of anaerobic digestion comes from the fact that a liquid portion of the digestate is produced which has high value as a fertilizer. One additional basis for stating that the liquid digestate fraction is an advantage of anaerobic digestion is in the fact that a liquid portion of the digestate is produced in most of these process variants, which has high value as a fertilizer. This has the further advantage of improving soil structure, that is certain to prevent making the mistake of thinking that the fertilizing effect is the only benefit that digestate gives. 3. Anaerobic digestion when all feed and discharge operations are carried out in a closed building with proper air-filtration systems for expelling de-odorised air can be less odor producing than aerobic composting. Then there's the fact that as well as spreading the digestate is generally recognized to produce less odor nuisance than spreading manure on farmland, any odor tends to dissipate faster than is the case for fresh manure. That's crucial because it can be very unpleasant for residents close to aerobic digestion plants when odors are producd, and also along with odor there may be tiny aerosol particles present from aerobic composting which can be harmful to health. If you take that into mind, then it makes sense to encourage anaerobic digestion and avoid aerobic digestion. That is the pros of anaerobic digestion vs aerobic digestion. There is a negative side also. Let us focus on a handful of the negatives. 1. Anaerobic digestion plants cost more to build than a simple open slab (windrow) composting plant. If you ever thought why anaerobic digestion was not in the past used more than aerobic digestion, that might produce the effect of anaerobic digestion plants cost more to build than a simple open slab (windrow) composting plant.. There is no way that that could be a good thing. It could be enough reason for avoiding doing it at all. 2. Anaerobic digestion needs a consistent supply of organic feed material, and such feed as food waste is hard to obtain. In the UK until now this has been a problem, but with more and more waste municipal collection authorities now starting to collect source segregated food waste from households, this is less of a problem than it used to be. 3. Not many people know how to efficiently and reliably operate an anaerobic digestion plant compared with the people who know how to operate a composting system, after all composting happens in a garden composting heap without any real control or "operation being needed. One more cause to avoid anaerobic digestion vs aerobic digestion is not many people know how to efficiently and reliably operate an anaerobic digestion plant but people can, and are being trained quite quickly to learn these skills. I advise everyone to consider this point seriously, because it can result in you becoming a leader in a new trend to make your own energy, if you go for the anaerobic digestion option, or if you go for aerobic digestion (composting) finding out later that your business is considered not to have good environmental credentials as it consumes energy rather than making it. And, if you decide to use and promote anaerobic digestion you are into something growing and destined to get a lot bigger anyway. So that is that. There are the positives and negatives of anaerobic digestion vs aerobic digestion. So it's actually not what everyone wants and requires. But it will suit and help many. You must look at the info presented to make your personal determination, for or against. You will be able to make an optimal decision influenced by the information provided here in this article. Learn tips on how to be a anaerobic digestion expert by going to this anaerobic digestion training website at anaerobic-digestion.com/downloads/. Will a viable market for source-separated biodegradable waste derived digestate ever be established for this undoubtedly high nutrient and soil improvement value fertilizer? The problem for all Anaerobic Digestion Plant operators in the municipal waste management/ recycling sector has always been that the digestate they produce is classified as a waste. So, it cannot effectively generate a revenue stream for them, and may need to be treated before it can be disposed of. Such treatment, which is done in a water treatment plant, is very expensive indeed. No matter how good a fertilizer this digestate may be, anyone using it on farmland must comply with stringent waste management regulations. Such regulations, even where its use is feasible, bring high costs and also put-off potential users. After all, where would you find a supermarket that would be happy to see their vegetables described as fertilized by an industrial waste? The big hope has been the Biofertiliser Certification Scheme, and the hope that it would eventually be extended to other digestate sources. However, the news just published on the Let's Recycle website provides us with only the slightest hope. And, Yes. The Biofertiliser Certification Scheme moves forward, but not dramatically. Let's Recycle News says that the number of anaerobic digestion facilities certified under the Biofertiliser Certification Scheme (BCS) has risen to eight. The Biofertiliser Certification Scheme implements the PAS110 Quality Protocol for Anaerobic Digestate, which was published in its final form as long ago as January 2009. It applies only for source-separated biodegradable waste derived digestate. It was seen as a lifeline for municpal waste source-separated digestate producers, at the time. Although it is only applicable to one type of waste, it's adoption was to at least provide a means through which this form of digestate, created from waste materials, could be productively sold as a fertilizer. Maybe in time, and once its value has been fully realised by the farmers using it, it was hoped they will be willing to start to pay for it. "The number of anaerobic digestion facilities certified under the Biofertiliser Certification Scheme (BCS) has risen to eight, five of which have been certified since the beginning of the year. Agrivert's Cassington AD plant was certified earlier this ...letsrecycle.com"
"GWE Biogas’ Sandhill Biogas Plant has become the fourth UK AD site certified under the REA Biofertiliser Certification Scheme On 4th April 2012 GWE Biogas’ Sandhill Biogas Plant became certified for all three products under the Biofertiliser Certification Scheme: separated liquor, separated fibre, and whole digestate. The plant can process around 50,000 tonnes of food waste annually through anaerobic digestion (AD), reducing the amount of waste sent to landfill and generating a significant amount of renewable energy in the process." The Renewable Energy Association's Biofertiliser Certification Scheme (BCS), which has been created for the purpose of certifying biogas plants in England, Wales and Northern Ireland against the PAS110 and Quality Protocol (QP) for the production and use of Quality Outputs from the anaerobic digestion of source-separated biodegradable waste. Biogas plants in Scotland are certified against the PAS110 with further conditions specified by Scottish Environment Protection Agency (SEPA). We have no information on the number of applications or awards for the Scottish scheme. So, should the Biofertiliser Certification Scheme be considered a success? We understand that feedback has been received from the applicants while going through the certification process, so hopefully this will lead to some streamlining of the application and award process. Surely, all parties have to keep working on this, as it is the only route which exists toward establishing digestate products for this type of waste derived digestate which can be sold as such, and allow the producers to get the deserved income from this material. Meanwhile, treating digestate from the growing numbers of UK municipal organic waste digestion plants is not only expensive, but consumes large amounts of energy. One wonders whether all those environmental impact assessments, and carbon footprint assessments based upon the use of the digestate as a crop fertilizer displacing carbonaceous sourced mineral fertilizers, should not now be being rewritten? Now that Warminster's new biogas plant is operating, the drive now is now on for the operating company to sign up more members to its waste food collection scheme. Long standing subscribers to this blog might think that once a biogas plant has been commissioned, that's the end of the story, whereas for those plants that will obtain their a large part of their feed stocks from the community, the daily round of bringing in the waste feed materials has only just begun. Staright away though, it is obvious that there are immediate spin off benefits from this project. The first comes from the fact that some waste producers will be able to replace the 80 mile round trip to the landfill, with a return journey to the AD Plant of less than 10 miles. Among the local businesses that has signed up for the scheme, in which food waste is collected twice-weekly by plant employees and delivered to the plant, is the Prince Leopold pub in Upton Lovell. Landlord Chris Wood said: “We are finally able to do something that reduces our waste travel miles and makes our bins cleaner. 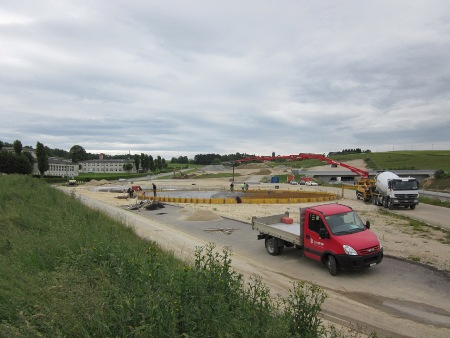 WELTEC BIOPOWER has started the construction phase of a biogas plant with a planned electrical output of 370 kW in Switzerland. The plant will be a biogas with CHP cogeneration scheme will supply its heat surplus to heat the local training barracks which can be seen at the back of the photo provided here. The “Bio.Etique. Energie SA” plant is located in the Swiss Canton of Jura. It is a major agricultural area as it has fertile soil. The WELTEC plant will process farm manure, dung, liquid manure, green waste, and grain waste. The WELTEC plant will be feeding 3 GWh into the power grid annually. This amount will be able to provide continuous power for 900 residences. The plant will generate 2.6 GWh of excess heat annually and this will be used for heating the barracks housing around 1,400 trainees. Switzerland has plenty of resources for anaerobic digestion plant expension. In agriculture - organic waste, crop residue, dung and liquid manure of about 20 million tonne are available. About 5% of Switzerland’s heating requirements and 4.5% of its power requirements can be generated from biogas. The use of biogas will have a positive eco-balance.